Everything I Know About Getting Up Backwards! 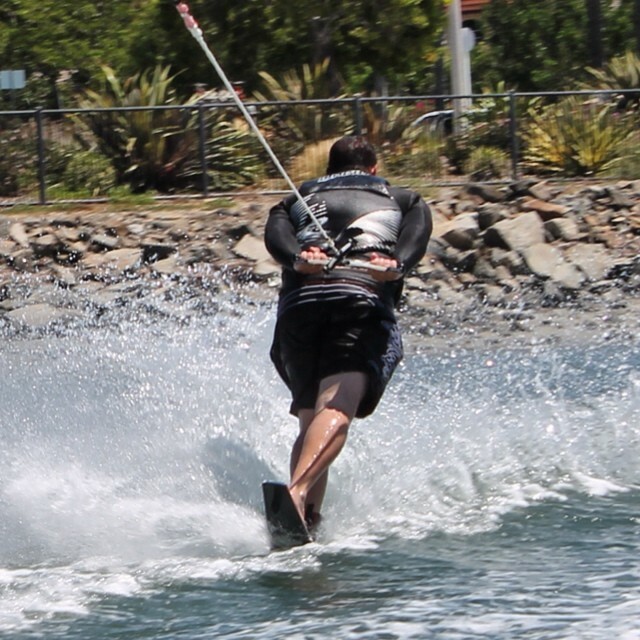 I have been often asked the trick to starting backwards on a slalom ski. My stock answer is to try it at least 100 times. And most advanced-intermediate skiers get it by then! But may be the time for me to modify that answer. 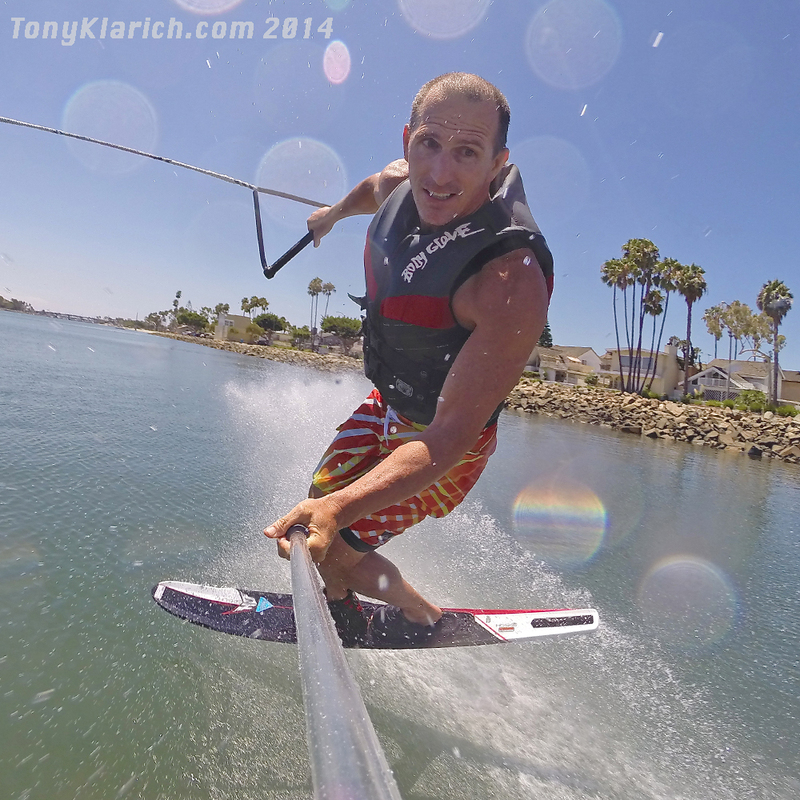 I have switched to a new ski lately, and my backwards starts are so much easier! The ski is the HO Freeride. It has increased surface area and tracks better backwards than any slalom ski I have ever been on. The Freeride really pops up easy for front and back starts. In fact my friend Kevin was able to make backwards starts on his new Freeride after several years of not making one. The HO Freeride is the Best Ski I Have Ever Been On! Here is the gear you will need to have the best chance of success. 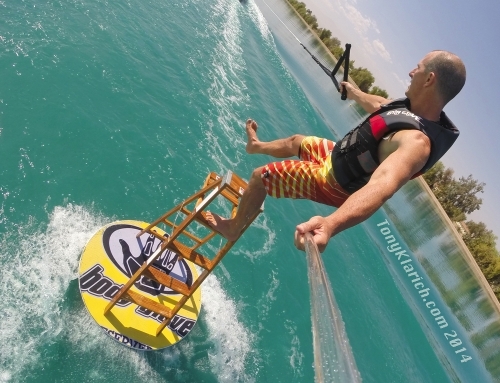 Handle: A wider handle such as one designed for wakeboarding or barefooting makes it easier to spread your arms apart to get them past your hips while standing. When using a regular wide slalom line I grip the handle with my pinkies outside the rope to create some extra space. Tower or Boom: The upward pull of the line helps you get out of the water easier. Right foot forward skiers face the boat with the ski on the right side of the rope. Left foot forward skiers begin with the ski on the left. Bump the boat in gear for a couple seconds, then when it goes back into neutral, use the line tension to spin 180 degrees. Your ski should now be on the opposite side of the rope. Use your free foot to kick and stabilize yourself. Take a deep breath, signal the driver to start, and dunk your head and shoulders down into the water. The handle goes against the backs of your knees. Continue to kick your free leg as a stabilizer. It should take about 5 seconds from the quick in-gear to the head dunk. Hold the handle firmly behind your knees, both palms up. You free leg continues to kick, with the knee bent and to the side. Think about the position of the ski relative to the water. 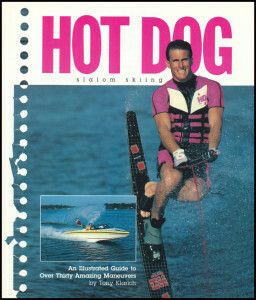 The tail should be just out of the water, with the angle of the ski at about 45 degrees. An up and down ski creates more drag and is much harder to get up. It helps to think about how the angle of the ski affects your start during a regular (forward) start, then apply that in reverse. Blow forcefully out your nose during the first few seconds of the pull. Most people forget this step, but learn the hard way after taking a couple of shots of water up the nose. Roll your shoulders forward and keep than handle against your knees. The initial pull is the hardest part of the trick, and is usually what takes people the longest to learn. Steer by moving the handle side-to-side and leaning slightly. Try and keep the ski pointed towards the boat. 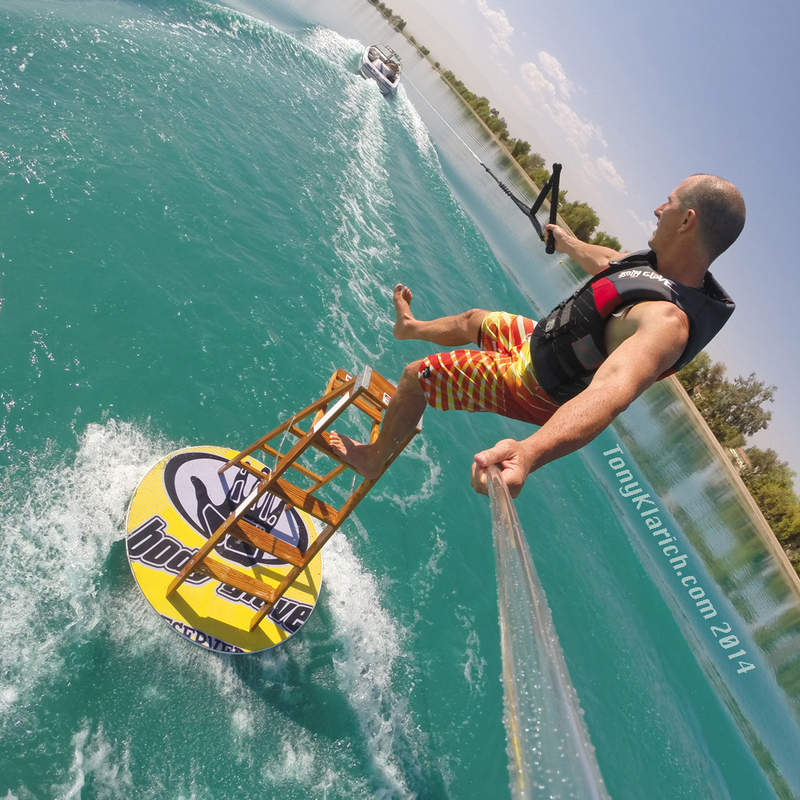 Once you are on top of the water, place your rear foot loosely into the back binding. This should take about 5 seconds or less. 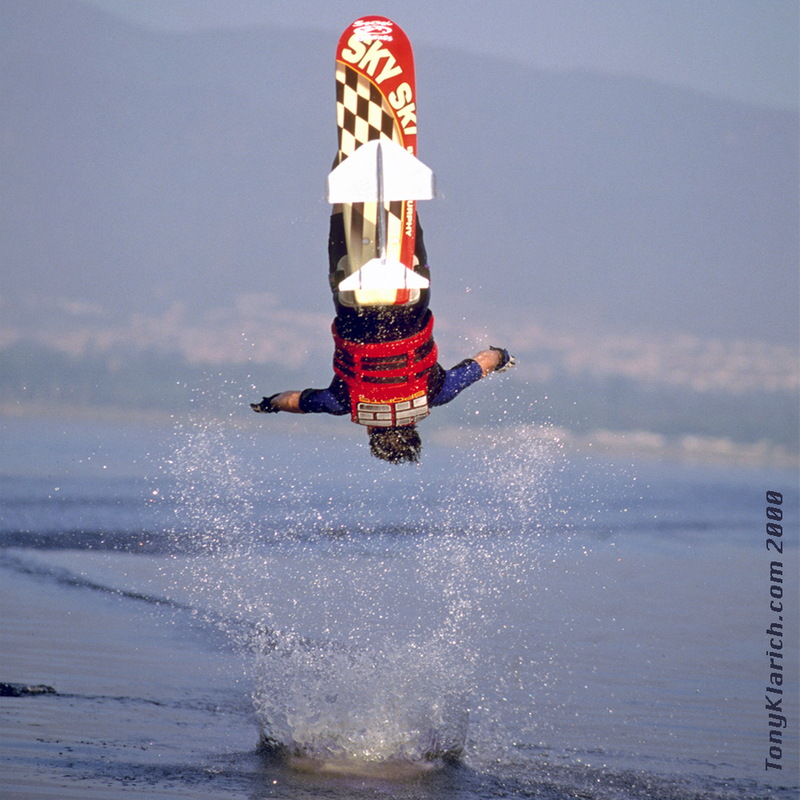 Raise yourself to the standing position as you feel the water become firm under you bindings. The handle below the knees position is unstable, especially as you speed up. Raising the handle above your hips can be tricky. I use a little pull to gain some slack in the line. It is also tougher with a wetsuit because of the increased drag. A wider handle or pinkies outside the line grip makes things easier. When you get your handle past the hips you are home free. Stand up straight with your head up, knees slightly bent and the handle in the small of your back. Wait for the water to be firm under your ski before turning. To make the turn, unload the ski by quickly straightening your knees and simultaneously letting go of the handle with 1 hand. The ski will naturally turn forward. Just remember to keep the ski edge up, and handle in near you hip during the turn. Quickly regrab with both hands near your stomach as you complete the turn. Initial Start: The boat speed should be medium to medium hard out of the hole depending on your weight. Our crew uses handle movement to signal speed changes while backwards. Side to side movement of the handle while backwards means slower (think minus sign). The up and down handle shake means faster. 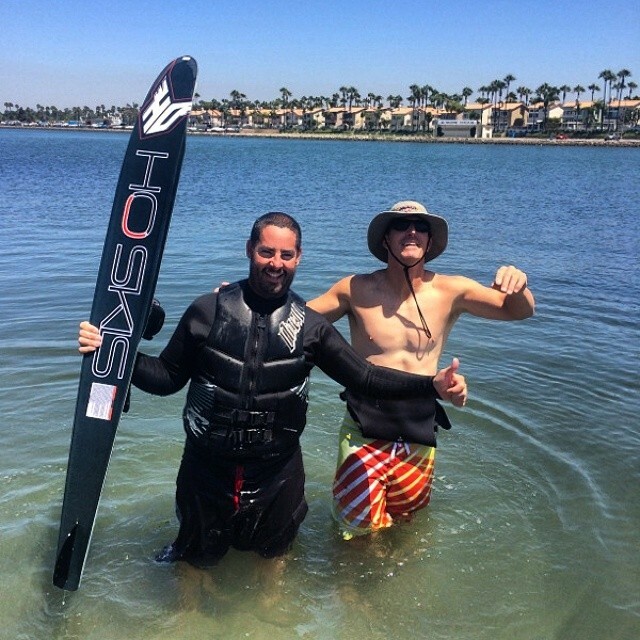 My Speeds: I weigh 195 and most often ride behind a regular ski boat (MasterCraft Pro Star). My start is close to full throttle out of the hole, then up to 24 mph for the turn. My normal slalom speed is 30-33, depending on the ski.